7am – 9am on on Tuesday 12th February 2019. The 2019 Business Awards launch will showcase the award categories for this year, outline the criteria behind each category, how to apply & what entering the awards can do for your business. Chamber Members and sponsors will be on hand to answer questions and give advice about how to make the most out of your entry, should you wish to take part. We are hoping to have another sell out event this year, so there is plenty of opportunity to get your business out there and network with the wide array of wonderful industries we have in the area! 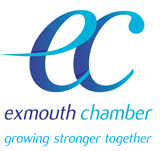 In order to arrange catering we would be grateful if you could please contact Laura Drake via email on secretary@exmouthchamber.co.uk should you need any special diets. Please note: this breakfast is free of charge, but if you book a place then do not attend on the day, you will be charged £10 and the money will be donated to the Chairman’s chosen charity. BOOK NOW BY CLICKING HERE – we have limited spaces so please, book soon to avoid disappointment.